Seven months into Seattle’s declared state of emergency on homelessness, advocates, public officials, and people living on the streets focused Wednesday on the major hurdles that continue to face the city and highlighted some of the more promising solutions. To alleviate the cycles of crisis that frequently trap people on the street, experts often tout the importance of housing first policies. Mayor Ed Murray said a project now getting underway on First Hill would do just that. On Wednesday, Murray celebrated the groundbreaking of Plymouth Housing Group’s 7th and Cherry building. “Time and again, when we are able to get people into permanent supportive housing like this, it is the most effective way to help them overcome the underlying causes of homelessness,” Murray said. Early intervention, prevention, and housing first were common themes also heard Wednesday inside the chambers of the King County Council. City Council member Sally Bagshaw and King County Council member Jeanne Kohl-Welles convened a special joint committee meeting to discuss homelessness and opioid addiction across the region. As chairs of their respective committees covering homelessness, the two council members recently returned from a trip to San Francisco to get an up close look at one program that will soon be replicated in Seattle. It is called the Navigation Center, meant to be a one-stop-shop for homeless housing and services. During Wednesday’s meeting, Bagshaw said she was impressed with how the San Francisco center managed to maintain low barriers of entry that keep many people out of Seattle’s current shelters. Those include allowing couples and small groups to stay together, admitting well-behaved pets, and dropping sobriety requirements. “It’s a matter of creating and sustaining community,” Bagshaw said. While Seattle will have to make do without the $3 million anonymous donation San Francisco got to jumpstart its center, Seattle and King County have pitched in $1.2 million to get it started. Seattle’s center is planned to be “dormitory style,” with showers, bathrooms, laundry, dining, and storage facilities. Case management, mental health services, and behavioral management services will be available at all hours, and the center will be able to hold 75 people at one time. “Folks have got to have a place to stay, they need services and a shower to make themselves feel human again,” Bagshaw said. Bagshaw is hoping Seattle will be able to open its center by the end of the year. In an encouraging sign for Seattle, San Francisco opened its second Navigation Center on Tuesday. Bagshaw praised San Francisco’s “pit stop” program, where the city’s public works department maintains a series of stations near encampments and shelters that include toilets, sinks, and needle disposal bins. While in San Francisco the council members also toured a center where heroin users can easily access buprenorphine, a medication that can help treat opioid addiction. City and county officials working on homelessness briefed the special joint committee on where the region currently stands on providing services. It is not an easy story to tell given complex funding sources and overlapping programs between housing and homelessness services. Through a dizzying barrage of slides and statistics officials painted a picture of a region that is doing a lot of good work but still struggling to stay afloat amid an onslaught of need. Mark Ellenbrook, the county’s regional housing and community development manager, said the county will never eliminate homelessness without the cooperation of private landlords and developers. “We cannot build enough units without working with them,” he said. King County Behavioral Health Organization serves more than 62,000 clients — 49,000 for mental health treatment and 13,000 for substance abuse services. In the past five years, King County has seen a dramatic increase in the number of referrals for determinations of involuntary mental health detainments. In the 35 years of Seattle housing levies, the city has built roughly 12,500 permanent units for very low income, seniors, and those with disabilities. Seattle’s general fund is the single largest source of low-income housing funding for the city, contributing $24 million. The overhead costs for King County homelessness programs are roughy 10%. State Rep. Tana Senn of Mercer Island said one third of prisoners in the state have mental illness and/or traumatic brain injury. In 2015, there were 156 heroin related deaths in King County. “If you want to build more affordable housing, stop tearing it down,” said one Real Change vendor. 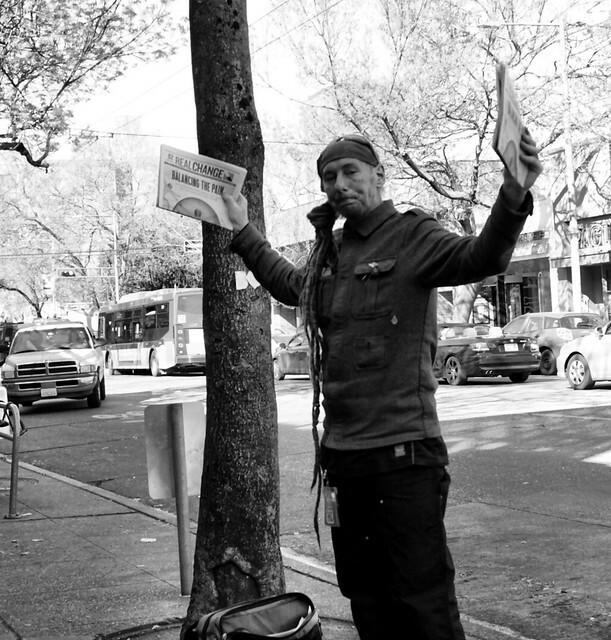 Meanwhile, a homeless outreach program that came to Capitol Hill in February continues its efforts to meet the immediate needs of people living outside in the neighborhood. Outreach workers from the Downtown Seattle Association team up with Seattle Police officers to go on daily directed patrols of Cal Anderson Park and Pike/Pine streets to offer everything from dry socks to temporary shelter. 26+ Seattle media outlets did their part Wednesday by participating in a day of focused coverage of the city’s homeless crisis. Large and small local news outlets (including CHS) highlighted past reporting and rolled out new stories under #SeaHomeless. The hashtag flooded Seattle social media channels Wednesday, including a Reddit AMA with a homeless man living in Seattle. The day also included a rally and processional around downtown to amplify the voices of homeless people in the search for solutions that work for them. You can read CHS’s coverage of homelessness on Capitol Hill here. This entry was posted in News, etc. and tagged city hall, homelessness, king county by Bryan Cohen. Bookmark the permalink. It’s encouraging that the City, and a few nonprofits, are now pivoting towards a “housing first” approach. It’s about time. Permanent housing is great as a first step, but it must be combined with effective “support services” to be successful over the long run. Such services are expensive, but a good investment towards truly helping the homeless. I agree, the “housing first” model is the best approach we currently have to helping solve homelessness. It’s also one of the most cost effective solutions to homelessness, even when associated support services are taken into consideration. Here is a solution to our homeless crisis. Provide housing and support services in exchange for real contributions back to society. I am sick of working all day so that people can have an apartment in the center of the city without working. It seems our politicians take pride in promoting laziness and lack of initiative. If you don’t work and refuse to work even if you can (the only excuse is very old age, severe disability, or mental illness that requires institutionalization) then I say there should be ZERO tax dollars spent on you. I don’t know these people and I don’t know their stories but I don’t care. I would feel ashamed if my entire existence was as a nuisance to others and a drain of resources. Wow, you sound like a terrible person! Do you not understand that most (ALL?) of these people cannot work due to mental instability, physical conditions and/or a myriad of other issues? What are we as a society if we cannot care for those amongst us that cannot care for themselves? And this is located in the center of the city so that these people can access services, you inconsiderate buffoon. Besides, if you want to live at 7th and Cherry, eye level with a viaducted I-5, be my guest. There is a market rate apartment next door called 7th/James Apartments. i agree with @wow, @sui. if what you wrote is truly how you feel; please leave this city. go find a home someplace where your opinions and bias will be welcomed with open arms. many cities in the south would surely take you. your kind of black and white analysis shows that you have a complete lack of understanding OR compassion. Based on your post, you should feel pretty ashamed because it appears your entire existence is a nuisance to a civilized society. And it was a drain on my resources to post a response. Tenants in subsidized housing (except for emergency/shelter short term) generally pay about 30% of their income towards rent. It’s not a free ride. Based on multiple data sources, providing housing to those on the streets actually saves tax payer dollars as it diverts from emergency care and jail. Spending zero dollars on the social safety net, fortunately, is not an option. But if you want to save tax dollars, housing first seems a solid option. You seem like the smartest person on this thread Sui. Coddling drug users and folks that won’t try to improve their lot in life is ridiculous. Help those that want help – everyone else can leave. Thing is…this isn’t a debate about whether or not we would like homeless people to pull themselves up out of homelessness and become middle-class homeowners. That’s a fantasy that has no bearing on our current reality, which demonstrates that homelessness isn’t going away. It is getting worse. So you can either sit here on the internet yelling about people don’t deserve help…while the homelessness numbers rise and rise, or you can decide to act like an adult and find some pragmatic solutions to the problem. Turns out screaming “you don’t deserve help! you are a drain on society! why can’t you just fix yourselves? !” at homeless people doesn’t give them shelter, or a job, or access to necessary services. You aren’t making an argument as to why we should help to end homelessness, you’re making an argument as to why we have a moral imperative to do nothing until people fix their problems with no help. @Local Social Worker: Is it not true that many people in subsidized housing receive a monthly check from the government? (either SSI or, for seniors, Social Security). And that this is their sole source of income, from which the 30% figure is calculated? This means that there is a “free ride,” at least for this segment of the low-income population. I’m not opposed to this…just pointing out who actually is paying their rent (the taxpayers). Zeeblebop, your comment about the south shows your ignorance and intolerance. I should add that substance abuse is not an excuse. Weakness and lack of self control is something to be looked down upon, not pitied. Every tax dollar spent on housing a drug addict Downtown means one less dollar for childcare, parks, transportation, and GASP one less dollar that we can choose to spend on ourselves. And tearing down housing to build 5x more units is ADDING housing not taking it away. Maybe a Real Change beggar is not an authority on housing issues. Perhaps we should pay attention to those that are not ignorant and have an ounce of understanding of the actual issues. The ignorance is yours, yes they are tearing down housing to rebuild more but have you been paying attention to rental prices lately? The new units are being built to make more money, smaller units, more of them in one lot and will never be affordable to anyone with a low income. People like you is what’s really wrong with this country. You sound like you have little to no understanding of addiction. I have experience with addiction, both first and second hand, and to varying degrees. I can tell you that addiction is crippling, and that housing stability is a step toward general stability and freedom from addiction. Have YOU paid any attention to what Utah has done in their movement towards “housing first”? They have dramatically reduced the cost of homelessness to society through this model. Sure, you can always point to a few cases where people take advantage of the system, but the majority of homeless are generally unfit to find stability on their own. Many homeless work and are unable to bring together first+last+deposit for rent, or have a history that prevents them from finding housing. There is a lot of research in the public domain pointed at the homelessness epidemic. Please, educate yourself before you take the easy route and condemn addiction as a personal choice and a weakness. I doubt you know addiction well enough to make that judgement. Says a person who has had no first hand experience with addiction (i.e., yourself or other family members you are close to). When countless medical studies and community programs have data that says this is absolutely not the case, maybe you should reevaluate your thoughts on this issue – unless of course you think science is lying, which given how you treat people, could very well be a truth to you. Go pull yourself up by your bootstraps somewhere else. The South is a nice place to live for your kind, they shame everyone and blame everyone for taking their money/jobs/whatever else, too. Thanks for the honest comment Sui, I couldn’t agree more! For what it’s worth, you can throw another hat into the “agree with Sui” commentary. Maybe not to the harsh extent that Sui’s opinions presented but I am going to interpret that as more frustration over this problem and the lack of accountability from anyone. But I still agree that we keep paying money into a system for people who have no conscious recognition as to how their actions affect themselves and greater community as a whole. The country should start looking at a Universal Basic Income, which means each citizen over age 18 gets, say $1000 per month. Our current hodge-podge approach to poverty is not working, The housing first model has some merit, but providing a free house for all homeless is a slippery slope. Minimum wage workers toil away while druggie street people get a free place? Where is the money for this going to come from? Including property taxes I now pay nearly 50% of my annual income in taxes. What is the “fair” number? Unless you’re a senior, that’s highly unlikely, but presumably a basic income would also provide tax relief to your apparently historically high burden. As in, whatever the basic income is would be tax-free, so your first $X of income would be equally tax-free. The money would be easy to find if we had proper corporate taxes. Right now, consumers shoulder most of the tax burden because the fear of job loss (makes politicians (who fear voter job loss would lead to their own job loss) grant corporations privileged tax status. 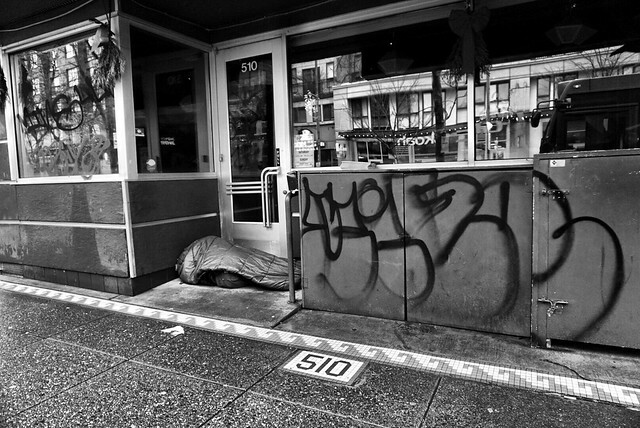 – A great many, likely more than 50% of street homeless are not from King County and were elsewhere 5 years ago. They came because of our welcome relative to where they were. In other words, the cause of a lot of our regional homelessness is because of our efforts, not in spite of them. – Few were displaced from local rental housing. Yes rents have gone up, but seriously, does anyone believe the folks they see who can’t or won’t pay for a place in town today at say 700.00 could pay 400.00 5 years ago? Ask a few where and when they last paid rent. – Many are addicts. It costs about 100.00 a day to be a heroin addict. Where do you think that money comes from? The car break ins and panhandling and other ‘productive’ acts. – Some claim to be disabled Veterans. Show me their DD 214’s (official discharge papers) and allow access to their medical records. – Utah is awesome and getting it right. I was there in March and drove around downtown. I saw a whole lot of folks camped out around the train station. – Addicts are helpless and have can’t change. Nonsense. Hard yes, but many do. Those who don’t I certainly have zero desire to provide my hard earned dollars for. – Many are mentally ill. True and shame on us for not helping those with schizophrenia and similar chronic illnesses. But if these individuals were the predominant homeless population, our parks, doorsteps and freeway right of ways would not be cesspools. And the prevalence of mental illness has not markedly changed and can’t account for the massive increases we see. – The rich are not taxed enough to pay for those who demand the fruits of our labor. I am among the successful. I pay about 42% in Federal Income taxes, and 10’s of thousands more in property, B & O, sales and others. Not complaining but just saying. I think I get a seat at table and ought not be marginalized because I don’t emote unconditional acceptance. I chose my charities and do not want to spend a single dollar on the majority of those on our streets. – It is not a right to live in central Seattle in prime real estate courtesy of others. It is an obligation to obey laws, contribute to the best of one ability. – Won’t does not mean can’t. Many writers confuse the two regularly and have little clue about human potential, substance abuse, mental illness and others. They patronize and infantilize, and expect little of others besides those who are successful to write ever-larger checks. – I want to see the jungle shut down and laws enforced. I want Seattle to be a place that welcomes those who contribute and firmly communicates in word and deed that those who can’t or won’t are not welcome, especially those who have purposely come because they have heard we are a great place to be taken care of by the likes of many of the commenters above. – I want to see scholarly research on the issue that is conducted by individuals with no skin in the game. This means no agencies that receive funds to care for homeless, no politicians, no advocates and nobody living on the streets. Study where folks are from, their medical, military, occupational and other histories, their sources of income, their drivers, choices made. And fact check. Publish this so the public can move from biased assumptions to real data. – Murray is a wimp for not closing the jungle. This issue will be pivotal in the next election and may contribute to the end of his reggime. Folks are fed up and I think my views may be more representative of the community than not. Yes! This is a fantastic comment. Well said. I hope you write these to the mayor, the new homelessness czar, and anyone else who would and should listen! !